Governor Herbert believes that our current state tax system is out-of-date and out-of-balance. This is especially true of our sales tax structure. In the 1980s, for example, sales taxes covered about 70 percent of the economy. Today sales tax covers just over 40 percent. Much of that comes from transitioning from a goods-based to a service-based economy. If the sales tax structure remains unchanged — even with improved government efficiency — state and local governments will not be able to pay for core services in the future. Policymakers will then have to choose between increasing tax rates or forgoing basic services. Both of these options could harm the economy. That is why, in his 2020 Fiscal Year Budget Proposal, Governor Herbert asked our state legislature to modernize our tax system — especially with respect to sales and use taxes — during the coming 2019 General Legislative Session. Consider some peculiarities of how we collect sales and use tax. Did you know that limousine services aren’t taxed but auto repairs on the family car are taxed? Did you know that lobbyists and lawyers don’t have to tax their services, but computer repair persons do? In Utah, you don’t have to pay taxes on an elective liposuction procedure, but women pay taxes every time they buy feminine hygiene products. Many of these tax exempt consumption services disproportionately favor those well-off enough to pay for limos, lobbyists or liposuction, while leaving the tax burden for essential services on Utahns who can’t afford those services. In fact, a Utah family of three with $25,000 in income directly pays about 3 percent of its income in sales tax; a similar family with $150,000 of income directly pays only about 1 percent of its income in sales tax. We can actually reduce the sales tax rate in Utah if more goods and services like limos, lobbyists and liposuction contributed to our sales tax base. Governor Herbert is proposing a sales tax rate reduction that would return $225 million tax return in budget revenues to the taxpayers. Additionally, he is calling on the Utah Legislature to broaden our tax base and lower our sales tax rate. If all economic activity in the state is taxed equally, then the state sales tax rate in Utah could be reduced from 4.85 percent to as low as 1.75 percent. This would be a net tax cut for nearly 9/10 Utahns, beginning next year. When everyone pays their fair share, everyone pays less tax. Because the overall economy is shifting from goods to services, a shift in the tax base from goods to services will make the system more fair. It would create a long-term path for fiscal stability that will allow state and local governments to provide essential services as our economy changes. 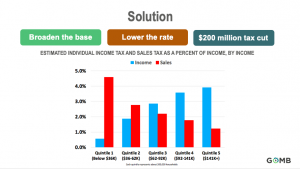 Q: Will broadening the base increase the amount I pay in taxes? A: For the vast majority of Utahns, especially lower and middle income Utahns, the answer is no. Governor Herbert’s proposal includes setting aside $225 million in the state budget. Ideally, this could help to lower the state sales tax rate from 4.85% to 1.75%. Currently, a Utah family of three with $25,000 in income directly pays about 3 percent of its income in sales tax; a similar family with $150,000 of income directly pays about 1 percent of its income in sales tax. Governor Herbert’s plan to modernize the Sales and Use Tax will bring greater balance to everyone. Q: When will the tax laws go into effect? A: Governor Herbert has asked our state legislature to modernize our tax system — especially with respect to sales and use taxes — during the current legislative session. If the legislature identifies this as a priority and proceeds with this plan, we could expect to see changes as early as July 2019. Q: What new services will be taxed? Did you know that limousine services aren’t taxed, but auto repairs on the family car are? Did you know that lobbyists and lawyers don’t have to tax their services, but computer repair persons do? In Utah, you don’t have to pay taxes on an elective liposuction procedure, but women pay taxes every time they buy feminine hygiene products. The governor believes this is unfair. Many tax exempt consumption services favor those well-off enough to pay for limos, lobbyists or liposuction, leaving the sales tax burden disproportionately on Utahns who can’t afford those services. The Kem C. Gardner Policy Institute’s Visual Guide to Tax Modernization in Utah is a good resource for understanding why these tax reforms are needed and how they could lighten the burden for many Utahns, while providing a reliable revenue stream for state government.